Christians United for Israel, along with 85 churches in North Georgia, North Alabama, and Southeast Tennessee, held a “Night to Honor Israel” on Thursday at the Colonnade in Ringgold. The mostly Christian audience of over 300 people showed their support of Jewish people and Israel. 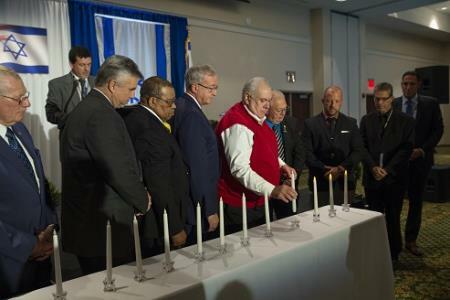 Eleven candles were lit by local pastors in memory of the Jewish people who died in the massacre at the Tree of Life Synagogue in Pittsburg and one for first responders. Keynote Speaker Erick Staklebeck inspired the audience with his emphasis on how the U.S.-Israel relationship is stronger than ever. “There is no more silence by Christians," said Mr. In discussing Israel’s threats, Mr. Stacklebeck described Iran as a threat moving across the Middle East and Israel is the first line of defense. Iran is building a land corridor across the Middle East and their goal is to “wipe Israel off the map.” Hezbolah is now a terrorist army that threatens Israel. Israel is the first line of defense for the West: “If Israel goes down, we all go down,” said Mr. Stacklebeck. He continued discussing how Israel and America have the same enemies. The Iranian regime sees Israel as the “little Satan” and America as the “big Satan." “What happens in the Middle East does not stay in the Middle East. Israel and Iran are on a collision course." The Christian and Jewish communities have been working together for six years to produce this annual event. Nationally CUFI was represented by Pastor Victor Styrsky, CUFI Eastern Regional coordinator and National Outreach director. Mr. Styrsky initiated a call to action that inspired the audience with personal stories of his commitment and those of family members. 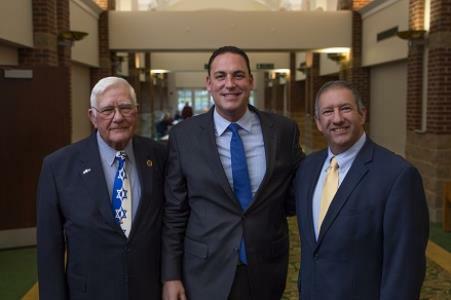 Local pastors, the Jewish Federation of Greater Chattanooga, an Israeli cultural emissary and CUFI City Directors also participated. Other local participants included the ROTC from Ringgold High School, and Boy Scouts from the Cherokee Area Council Boy Scouts of America. Christians United for Israel is the largest pro-Israel organization in the United States with over 4.3 million members and one of the leading Christian grassroots movements in the world. CUFI’s mission is to educate Christians about the biblical and moral imperatives to support Israel and to activate Christians to speak out on Israel’s behalf to churches, communities and leaders in Congress. CUFI provides a national association through which every pro-Israel church, para church organization, ministry or individual in America can speak and act with one voice in support of Israel in matters related to Biblical issues. Prime Minister Benjamin Netanyahu described CUFI as a vital part of Israel’s national security. To contact Christians United for Israel go to: www.cufi.org.